Today, the card game known as faro is all but forgotten, but when America was young  before windsurfing, Packard automobiles, computers, Hoover Dam, the Scopes “monkey” trial, Route 66 or wind farms in the desert had ever been mentioned  faro was the most popular card game in the country. On the frontier, from Deadwood to Tijuana, from Reno to Langtry, from New Orleans to St. Louis and countless places in between, the faro table was a familiar sight and sound to virtually all persons who hung out in saloons. Faro originated in France around 1713 as a revised form of the popular British pub game, basset. King Louis the XIV outlawed basset in 1691. Although both faro and basset were forbidden in France, these games remained popular in England during the 18th century because they were easy to learn and, when played honestly, the odds for a player were the best of all gambling games. The word “faro” came from the court of King Louis XIV, where one of the cards in a standard playing deck bore the face of an Egyptian pharaoh. Scottish expatriate John Law (1671 to 1729) introduced an early version of the game in the Americas around 1717 in what was to become the city of New Orleans. The son of a goldsmith, Law, in his youth, participated in a duel in England; because his victim was the son of a prominent politician, he was forced to flee England. Later, he wound up in Scotland, where, in 1705, he proposed a National Bank and the printing of paper money. Following the Scottish Parliament’s rejection of these proposals, Law moved to France. Louis XIV expelled Law from France in 1714 for accruing heavy gambling debts on behalf of the King’s nephew, Philippe II, the Duke of Orleans. Law returned to France following the King’s death and, with the help of his friend, Philippe, he went on to form the Royal Bank of France and print the first government-backed paper currency. In time, Law established the North American Indian Trading Company. For 25 years, this company held a monopoly on all French overseas trade. Following the Louisiana Purchase in 1803, Law endorsed the game of faro, which spread up the Mississippi River on riverboats, where it became a favorite among professional gamblers and players alike. Since the mid-1800s, the presiding mythical deity of the game of faro has been the Bengal tiger; both ‘bucking the tiger” and “twisting the tiger’s tail” have been common euphemisms for playing the game. Back alleys, streets and urban areas that featured many gambling parlors were often referred to as “tiger alley” or “tiger town,” because faro was the prominent gambling game of the time. 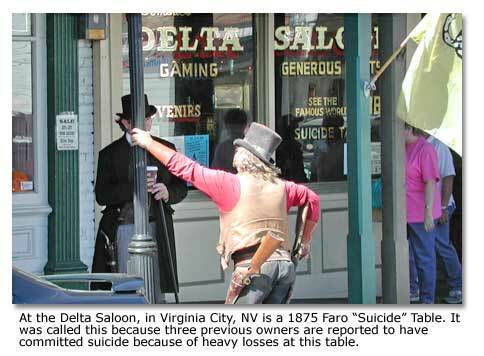 So popular was the game that faro gaming tables could be found in just about every saloon in every frontier town. Draw poker (“bluff” or “bluff poker” as it was called back then) was actually a rarity on the frontier until the late 1870s. In contrast, almost every saloon featured at least one faro table, particularly during the Gold Rush period from 1849 to 1890. In 1882, a New York Police Gazette study estimated that more money was wagered on faro in the U. S. each year, than on all other forms of gambling combined. While faro became scarce after World War II, it continued to be dealt at a few Las Vegas casinos through the 1970s. Jackie Gaughan, owner of the El Cortez casino in Las Vegas will, it is claimed, occasionally still deal a private game for friends and employees. The faro table was square, with a cutout for the banker, that is, the house. 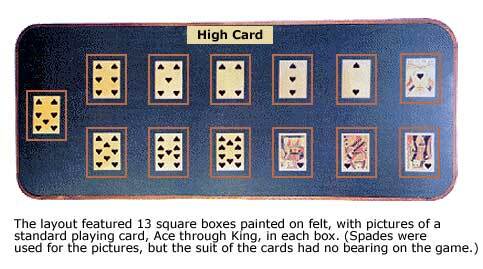 The layout featured 13 square boxes painted on felt, with pictures of a standard playing card, Ace through King, in each box. (Spades were used for the pictures, but the suit of the cards had no bearing on the game.) A 52-card deck was dealt from a box that was sitting upside down. A spring inside the box pushed the deck toward the top. Cards were revealed one at a time, face up. The first card was a dead card because it could be seen as soon as the cards were placed in the box. Gamblers placed bets directly on the 13 squares. A player bet a number either to win or lose. Each player laid his stake on one of the 13 cards on the layout. Players could place multiple bets and could bet on multiple cards simultaneously by placing their bet between cards, or on specific card edges. Then the dealer would draw two cards. The first card was placed beside the box and declared the losing card. The second card was left exposed in the box and declared the winner. So, if the two cards were, say, a “2” and a “Jack,” then all bets on the 2 are lost by the players and won by the bank. All bets on the Jack to win were paid. If you’re thinking the game is pure chance, you’re almost right. The only element of strategy involved the “casekeeper.” The case he kept was similar to the device at a roulette table that shows the last 10 numbers called. It was a scoreboard showing the 13 cards; each time one of the numbers was drawn, the casekeeper would move an abacus bead across a string and place it in front of that number. A bead to the left meant the card had been drawn a winner. To the right, meant a loser. When the number had been called three times, he called the “cases,” which meant only one card remained in the deck. After that card was drawn, the four beads would be snapped together, indicating that the number was dead. The farther you get into the deck, the more interesting the game becomes. With fewer and fewer numbers to bet on, the bets tend to get larger. The final bet, when there are three cards remaining in the deck, is known as “calling the turn.” The object is to predict the order of those three cards: the loser, followed by the winner, followed by the “hock” card, which is not used. If you hit this bet, it pays four to oneunless two of the last cards are identical, in which case it pays two to one. That final bet was the most popular moment in the game, even though it is the one that had the best odds for the banker. The actual odds on it are five to one, but it only pays at four to one, giving the casino a 16 2/3 percent advantage. The only other time the casino has an advantage is on a “push”when two identical cards are drawn on a turn. When that occurs, the house takes back half the bet, for a two percent edge. The ideal time to bet is after three cards of any card value have been played. The house has no advantage at that point; consequently, smart players could go heads up with the casino provided they hung around the game until the table turned in their favor. Faro was usually played at a noisy table. Players stood around the edges, similar to a craps layout, and any number could play, although it began to get crowded if more than ten tried to muscle in at the same time. Three casino employees ran the gamea dealer, a “casekeeper,” and a “lookout,” who watched the bets being made and ruled on disputes that arose. Faro is the game played in Russian poet and essayist Alexander Pushkin’s short story The Queen of Spades. It is also played in Russian writer’s Fyodor Dostoevsky’s classic novel The Brothers Karamazov. (Interestingly, financial troubles resulting from faro-induced gambling debts clouded Dostoevsky’s later years.) Giovanni Jacopo (Don Juan) Casanova, an 18th century Italian adventurer and writer, in his autobiography, depicts faro as it was played in 18th century Europe; the game evidently was one of the rogue’s primary sources of income. And in British novelist William Thackeray’s The Memoirs of Barry Lyndon, Esq., the title character makes a career helping his uncle cheat professionally at faro. On the TV screen, characters in saloons play faro on the HBO series “Deadwood.” Scenes involving the game of faro, with varying degrees of accuracy, appear in the movies Tombstone (1993), starring Kurt Russell as Wyatt Earp and Val Kilmer as Doc Holliday, and in Wyatt Earp, where viewers see Earp (portrayed by Kevin Costner) and his brothers playing faro. Faro is also shown in the Costner/Robert Duval movie Open Range, and many other flicks that attempt to portray the Old West period accurately. In the film The Sting, it is said that the gangster Doyle Lonnegan (played by Robert Shaw) only plays faro when he goes out to casinos, sometimes for 15 to 20 hours straight, with just him against the house. Faro’s demise was brought about by a combination of many factors: two in particular stand out. The opportunity for dealer cheating at faro was greater than with any other card game, and, for people who ran the casinos, faro had a low house edge. In an honest faro game, a player’s chances are just short of even, and are much better than most games played at contemporary casinos. Faro was the single most popular saloon gambling game in the Old West from 1825 through 1915. By 1925, however, it had all but vanished, in favor of craps, roulette and other games that have enticing payouts but give a much greater “edge” to the house. If you search through the list of well-known Wild West gamblers, you will find that while they are remembered for their poker savvy, they got rich off faro. However, most didn’t actually play the game; instead, they banked the game. Doc Holliday, among many others, was an itinerant faro dealer, toting the table apparatus with him wherever he traveled. And therein lies the problemthe dealer’s box. There were generally two kinds of cheating boxesthose that would indicate to a dealer what cards were coming up, so the dealer could discreetly shift a player’s bet off the winning card before it was drawn, and those that allowed a dealer to put through two cards simultaneously. Other forms of cheating by dealers included the use of stacked decks (with many paired cards), and shaved, textured or uneven card decks that allowed a dealer to discreetly shuffle or manipulate a deck in such a way so as to create pairs, or make paired cards much more likely during play. Dealers were not the only ones cheating at faro. Carefully practiced distraction techniques and sleight of hand by dishonest players were common. Proven cheating oftentimes resulted in gunplay or a brawl, both of which gave better odds to a player, unless he was in a “skinning den” (a term used for a game where most of the people in the room were cooperating together to cheat an unsuspecting player). After 1900, a variety of other games with much better odds for the house (but more enticing payoffs for the players) surpassed faro in availability and popularity. In 1900, there were 1000+ registered gaming establishments offering faro in Arizona Territory; by 1907, however, faro had been completely outlawed there. By the 1930s, the only legal faro games were in Nevada. 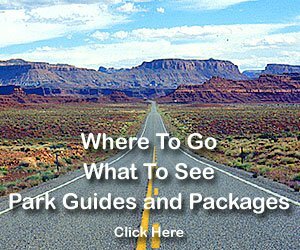 Only five active faro banks were known to exist in Nevada by the 1950’s. The renowned faro bank at the Horseshoe Casino in Las Vegas closed in 1955, the Union Plaza in Ely, Nevada, closed its faro bank in 1975, and the last faro bank disappeared from the Ramada in Reno in 1985. 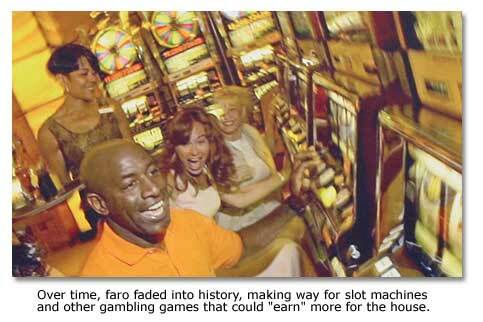 Over time, faro faded into history, making way for slot machines and other gambling games that could “earn” more for the house. The amazing thing is that faro remained popular long after it had become known as a cheater’s paradise. Partly it’s the psychology of communal betting. You get somewhat the same atmosphere at a craps table, where people throwing money down on a table can produce a kind of temporary group madness. Faro is also a fast game. One doesn’t really have time to grieve over your losses. 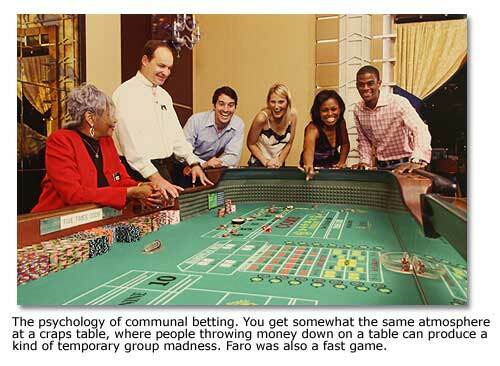 The cumulative effect was to make faro a lively, noisy, very social game. One of the great injustices to the game of faro was the fact that books and western films of the 1940s, as well as popular western TV shows, all disregarded faro in favor of poker. This was because audiences (and the writers and directors themselves) were unfamiliar with faro, while in contrast, poker was very popular with the public. Authors and directors consistently portrayed cowboys playing poker in their books and films because they knew audiences could identify with the game. Consequently, generations of people have been misled into believing poker was commonly played throughout the 19th century. It was not until John Wayne’s last movie, The Shootist, in 1976, that western movie directors attempted to “get it right” by portraying faro being played in films. However, even many well-intended filmmakers have shown faro being played incorrectly, or have added derogatory references and inaccurate statements about the game; these have lead to a widespread misunderstanding of faro and the persons who played it. The game forms an interesting part of Western lore and reminds history-conscious people that poker was not the card game played in many 19th-century saloons. Faro was. Clay Worst's lecture on the History of the Lost Dutchman Mine,in 2011 was a huge success... Due mostly to his telling of the legend, in a way that only someone who has lived it for 63 years could do! Other than an occasional ringing of a cell phone, (which was quickly silenced) and random gasps from the crowd. There was total silence, as the legend of the Lost Dutchman Mine came to life in a very interesting and informative presentation.